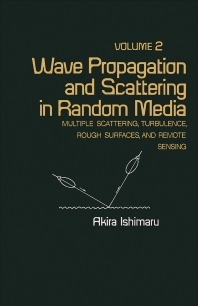 Wave Propagation and Scattering in Random Media, Volume 2, presents the fundamental formulations of wave propagation and scattering in random media in a unified and systematic manner. The topics covered in this book may be grouped into three categories: waves in random scatterers, waves in random continua, and rough surface scattering. Random scatterers are random distributions of many particles. Examples are rain, fog, smog, hail, ocean particles, red blood cells, polymers, and other particles in a state of Brownian motion. Random continua are the media whose characteristics vary randomly and continuously in time and space. Examples are clear air turbulence, jet engine exhaust, tropospheric and ionospheric turbulence, ocean turbulence, and biological media such as tissue and muscle. Rough surface examples are the ocean surface, planetary surfaces, interfaces between different biological media, and the surface roughness of an optical fiber. This book is intended for engineers and scientists interested in optical, acoustic, and microwave propagation and scattering in atmospheres, oceans, and biological media, and particularly for those involved in communication through such media and remote sensing of the characteristics of these media. 14-6 Plane Wave Incidence on a Slab of Scatterers—"Total Intensity"